Please note that the content of this book primarily consists of articles available from Wikipedia or other free sources online. 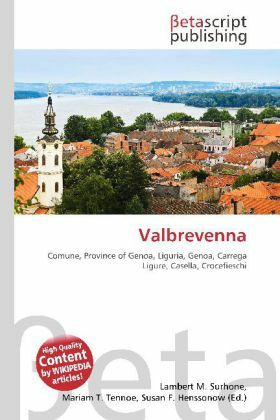 Valbrevenna is a comune (municipality) in the Province of Genoa in the Italian region Liguria, located about 15 km northeast of Genoa. As of 31 December 2004, it had a population of 764 and an area of 35.2 km². Valbrevenna borders the following municipalities: Carrega Ligure, Casella, Crocefieschi, Montoggio, Propata, Savignone, Torriglia, Vobbia. All demographics and other statistics: Italian statistical institute Istat.